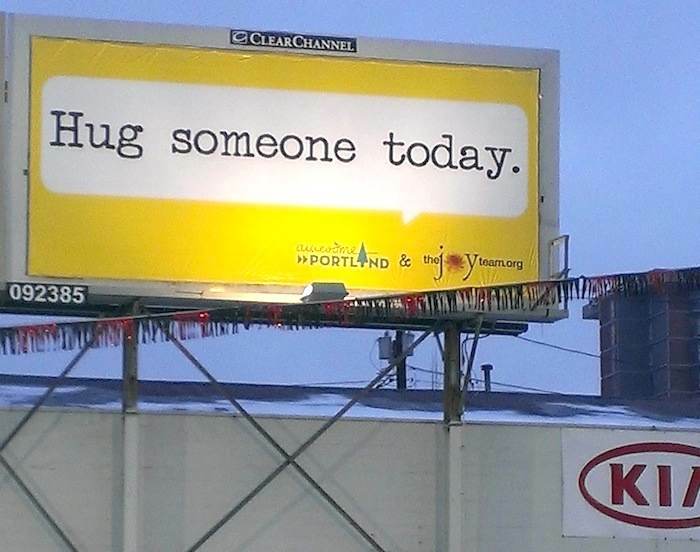 During this cold and flu season, The Joy Team of Vancouver, Washington, has erected a billboard in downtown Portland reminding everyone of that ancient holistic prescription that’s not only free, but also effective: hugging. Just in time for “Random Acts of Kindness Week” (Feb. 9-16) and Valentine’s Day (Feb. 14), the fifth in a series of monthly positive messages went up suggesting that onlookers, “Hug someone today”. Paid for by a grant from Awesome Portland, the bright yellow billboard can be found in Portland, Ore., on MLK Jr Blvd, 100 feet South of Broadway, on the West side of the street facing North. The first board, with the message “Be Happy” drawn by a child on the Junior Joy Team, was the first up when the campaign started in October. The Joy Team, a non-profit 501c3 organization promotes the mission of building community by spreading joy, optimism and inspiration. Other projects include delivering Happy Packets to the staff of organizations serving the community, Chalk the Walks, PB & JOY Project and The Junior Joy Team. Learn more at thejoyteam.org.